“Scry” by Anne Ivy, one of the stories from our special BCS Science-Fantasy Month theme month in 2012, is now an audio podcast at Podcastle. By coincidence, the podcasting of that great BCS science-fantasy story comes as we are preparing another BCS Science-Fantasy theme month! To run this March, 2014. 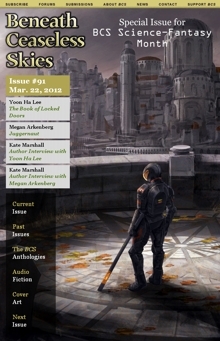 It will feature two more special issues of great science-fantasy stories–stories combining the awe-inspiring fantastical settings that fill BCS fiction, but blended with futuristic details like the laser rifles, plastic keycards, and electronic subway in “Scry.” Along with special podcasts, cover art, and signed book giveaways. Contributors will include returning BCS authors Aliette de Bodard, Yoon Ha Lee (whose story “The Book of Locked Doors” was in our previous Science-Fantasy Month), newcomer Rachel Sobel, and more.